AMP Yogyakarta holds silent protest commemorating Operation Trikora invasion of Papua. Hundreds of Papuan students belonging to the Papuan Students Alliance (AMP) staged a silent protest on Wednesday (19/12) commemorating the 51st anniversary of Trikora, the campaign that enabled the military invasion of West Papua by Indonesian forces. The mass action began with a long march from the Papuan student hostel ‘Kamasan 1’ to the centre of town in front of the Post Office, at 11.00, West Indonesian time [WIB]. The students carried and wore messages about their protest as local media followed events from the sidelines, despite heavy rain. One of the protest co-ordinators, Phaul Hegemur, said that on 19 December 1961, then Indonesian president Soekarno proclaimed TRIKORA (Tri Komando Rakyat, or the Triple People’s Command) in the North Alun-Alun [town square], intended to stymie the formation of the independent state of West Papua that had been declared on 1 December 1961 whilst under Netherlands administration. Following that, Soekarno as Commander of the forces for the ‘Liberation of West Irian’ [now Papua] issued Presidential Decree. 1 of 1962, which ordered the Mandala Commander, Major General Soeharto, to conduct a military operation to seize the territory of West Papua as a region of Indonesia, said Phaul. “So there followed several waves of Military Operations: among others by air, were Operation Banten Kedaton, Operation Garuda, Operation Serigala, Operation Kancil, Operation Naga, Operation Rajawali, Operation Lumbung, Operation Jatayu. Operations by sea included Operation Show of Force, Operation Cakra, and Operation Lumba-Lumba,” Hegemur said. 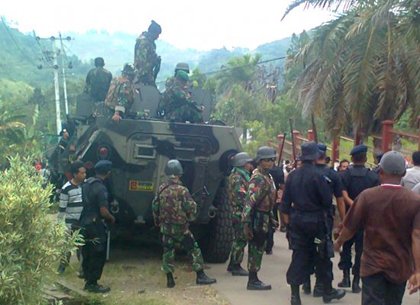 Human Rights violations against the Papuan people continue to occur due to the brutality of the Indonesian military. That we vehemently oppose the results of International Law (the New York Agreement and the Rome Agreement), and make the UN immediately responsible to reverse the unilateral surrendering of West Papua to the Republic of Indonesia, based on the people’s decision of 1969 [Pepera] which led to the United Nations General Assembly Resolution No. 2504 (XXIV) condemning Pepera as undemocratic and unrepresentative. 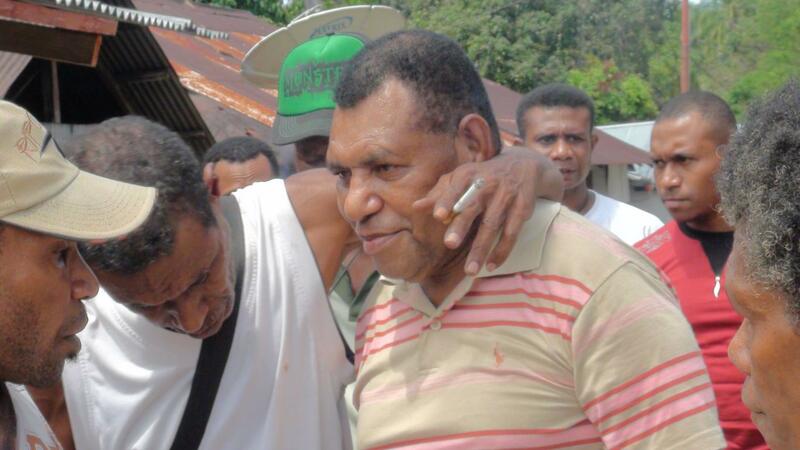 Finally that a REFERENDUM of the Papuan people be held soon. Tapol: Britain and Indonesia – Too close for comfort? British-funded training of Indonesia’s anti-terror police, Special Detachment 88, should be reviewed in the light of serious concerns about the unit’s human rights record and its operations in Papua, says TAPOL ahead of a state visit to London by Indonesian President Susilo Bambang Yudhoyono from 31 October to 2 November 2012. Five political prisoners, imprisoned for raising the Morning Star flag on 19 July 2008 in front of the Fakfak Act of Free Choice building, were freed today. They were condemned to four years in prison by the Fakfak court and have now been released having served three years, five months and three days of their sentence. Simon Tuturop, Tadeus Weripang, Benediktus Tuturop, Tomas Nimbitkendik and Teles Piahar were collected from the prison by Freddy Warpopor, the Fakfak Area Coordinator of Foker NGO Papua, and other friends by two minibuses and several motorbikes, according to a Foker NGO press release. The group left the prison at 09:30. They went to the house of Eligius Warpopor, a community leader in Gewerpe Village, where they were greeted by the people of Gerwerpe. Simon Tuturop made a speech thanking the people of Gewerpe Village, as well as the Papuan Customary Institute (Lembaga Adat Papua), Elsham Papua, Foker NGO, LP3BH Manokwari, Amnesty International and the ICRC. He said that they had helped to greatly reduce their suffering in prison. 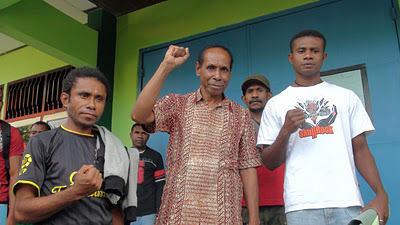 On 19 July 2008, Tuturop led a flag-raising of the Morning Star flag where 44 people were arrested by Indonesian police. Five were found guilty by the Indonesian court in Fakfak and convicted of treason under articles 106 and 110 of the Indonesian criminal code. Elsham Papua, LP3BH Manokwari and Foker NGO Papua regard them as innocent prisoners of conscience who did not committed any violent acts. To express a desire for independence is part of the freedom to express political aspirations. It is not a criminal act. These three organisations continued to advocate for them and defend them. The group then continued their journey to Wayati Village to bring Tadeus Weripang back home. The people of Wayati Village and the village chief were already waiting for Tadeus Weripang’s arrival. Warpopor said, “It was a great welcome, despite the tumultous atmosphere. Some people shed tears.” Village chief Plerius Kondawe gave his thanks to the three organisations. “Let’s all support this process, so that we can determine the right format that Papuans will later use in the dialogue, and another important thing is that this struggle is a non-violent struggle. Let’s unite to save the country and this land of Papua,”said Warporpor. A 5000-strong Third Papuan People’s Congress took place over three days in a Jayapura field ringed with menacing armoured riot control vehicles and heavily armed police and soldiers. It was led by Forkorus Yaboisembut, chair of the Papuan Customary Council, who is highlighted on the Indonesian military’s leaked watch list of dangerous “separatists”. As the Congress came to an end on October 19, Forkorus read a Declaration of Independence first penned in 1961, prior to the Indonesian take-over of the territory. 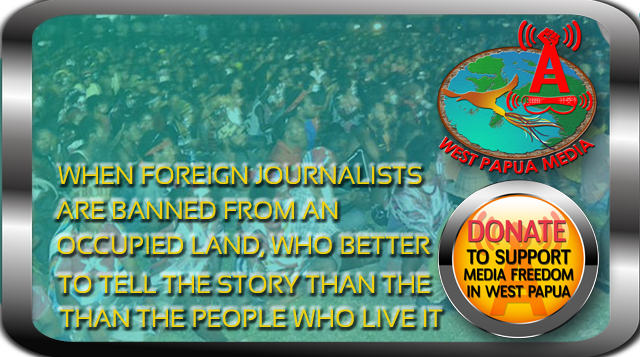 He then announced that he had been elected to be the “President” of the “Democratic Republic of West Papua”. As the gathering began to disperse, the military began firing from their assault weapons and launched themselves on the crowd, arresting and beating some 300 people. Forkorus was forcibly arrested along with his “Prime Minister” Edison Waromi and they and three others now face charges of treason. Dozens were injured, many with gunshot wounds, and up to six people were killed. The first death to be confirmed was that of a law student Daniel Kadepa who was shot in the head as he tried to flee. Many terrified delegates tried to seek refuge in the nearby Catholic Seminary. Fr Neles Tebay, a prominent advocate for peaceful dialogue, has supplied a detailed account of the violent disruption and brutality displayed as the soldiers invaded the sacrosanct mission complex. Terrified students were tear-gassed and threatened at gunpoint while one Franciscan brother was taken into custody despite the serious injuries he sustained in the attack. Petrus Ayamiseba, one of the striking workers, was shot dead by the Indonesian police on October 10, provoking Papuan outrage and an unprecedented level of international union solidarity for the Freeport workers. Since then at least three others have been killed in the area by unknown assailants. Rather than conciliation, the mine management has resorted to hiring contract workers as scabs. Freeport McMoRan has had a dream run for more than 40 years. The first contract negotiated with President Suharto gave the mining company virtually free rein as well as generous tax concessions. This was in 1967 when Indonesia did not even have formal control over the territory. In 1969, Indonesia pulled off a self-determination fraud by conducting a so called “Act of Free Choice” ( known as the “Act of No Choice” to the indigenous Papuans). Just over a thousand Papuan men took part out of a population at the time of nearly one million. The Freeport mine has always been synonymous with violence and grave human rights abuses, as well as environmental destruction and the abuse of customary land rights. Amungme and Kamoro tribal people have had little recourse but to watch as the mine took over their lands and “decapitated” their sacred mountain. In the last few years, especially since some Western mine employees were gunned down on the mine access road, the company has come under international scrutiny. However, the Jakarta government is in no hurry to interrupt the flow of taxes, dividends and royalties from Freeport, its biggest taxpayer. There is an ongoing controversy around the way in which Freeport pays out millions of dollars so that Indonesian military and police forces can provide its security. Direct payments to individual police officers were supposed to have stopped, but the National Police Chief Timur Pradopo revealed in October that these payments of “lunch money” continue. The security forces have a direct stake in a level of ongoing insecurity, a factor many believe underlies much of the violence in the area. Following recent events, Indonesia has sent in yet more police and tried to justify the scandalous actions of its security forces as necessary to deal with “separatism”. Why has New Zealand made no public statement condemning this latest crackdown? Our Government Superannuation fund and other Crown Financial Institutes invest in Freeport McMoRan. Both government and the Superannuation Fund Board have so far resisted all calls to follow the ethical example of the Norwegian Government Pension Fund which divested from Freeport in 2006. The New Zealand Minister of Defence recently talked about increasing our defence ties with Indonesia by extending the training we currently offer to Indonesian officers and hosting some “higher level” visits of Indonesian personnel. 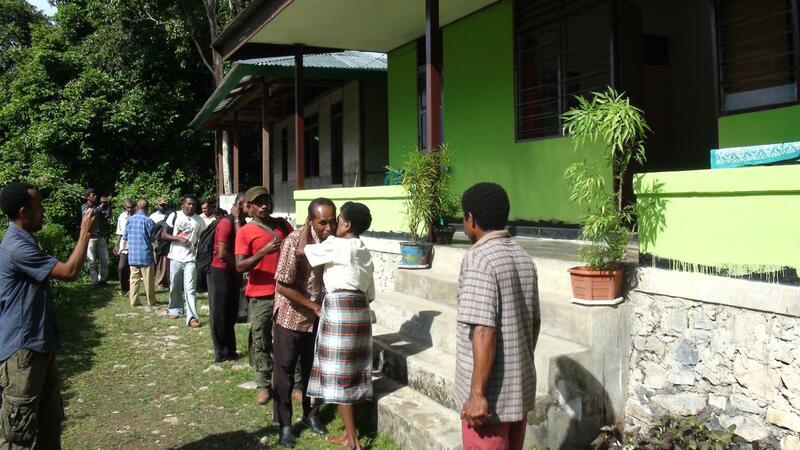 We also have an NZAID training programme for the mainly migrant West Papua police. We promote “community policing”, a non-confrontational model that is about as far from current Papuan police practice as it is possible to imagine. Maire Leadbeater is spokesperson for the Indonesia Human Rights Committee. This article was first published on the New Zealand Herald Online.